In 2012, while some people were preparing for the apocalypse, most gamers were enjoying another year of video games. During that year, the first game in a new series called “The Denpa Men” was released. This series had a very unique concept that made it stand out from any other game, and that is the way you recruit new characters known as Denpa Men. This unique way of recruiting Denpa men is that they reside in radio waves; therefore where there are radio waves, there are Denpa Men. It also takes advantage of the 3DS’ gyroscope, simply move the 3DS around to look for and capture Denpa Men that are floating around in radio waves. You can even scan QR codes to get Denpa Men if you need to. The second game in the series, The Denpa Men 2: Beyond the Waves was released in 2013, and is what this review is about. It is not necessary to play the first game in the series to enjoy the second game, as the second game’s story stands on its own. However if you do own the first game you can transfer your Denpa Men to the second game. 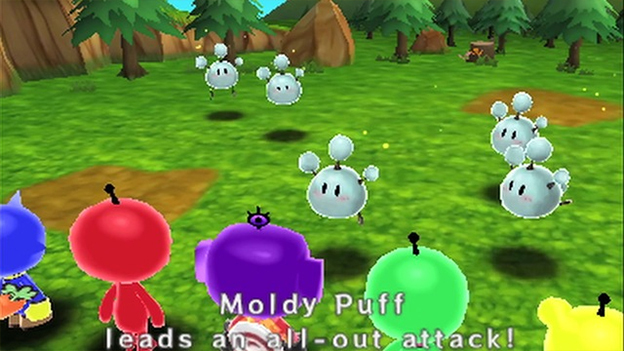 Capturing the Denpa Men is just a very small part of the game; the main part is in the form of a simplistic RPG. The story starts as a Denpa Man by the name of Tracy has his family kidnapped, and he has to go save them. The story isn’t very deep; in fact at one point I forgot what the point of the game was. The few times your character does talk, it’s usually when you run into a boss or enter a new dungeon, and the dialogue is short. The battle system is very simple, and it mainly depends of what kind of Denpa Men you have. There are the ones that have antennas and ones that don’t. The ones that have antennas have powers they can use. The powers are either a special attack, a power-up you can use on your team, a status effect you can use on the enemy, or a form of healing your team. The ones that don’t have antennas have no special power, but are generally stronger in every other way. During your turn you can use these powers, use a regular attack, use an item, or defend. There isn’t much strategy in battle, as most of the strategy comes from equipment. Your Denpa Men can equip five different pieces of equipment, one for their head, their back, their arms, their legs, and their clothing. These sets of equipment can range from an element attack, element resistance, typical stat increasers such as speed and attack, and more. Choosing the proper equipment is crucial to your strategy, as most enemies have an element attack, and an element weakness. This can be the deciding factor between winning and losing a boss battle. I had very mixed feelings about the music in this game. While I liked the music, I felt that a few of the tracks were not set for the right mood. The boss music didn’t feel like boss music in any way, and I feel that the boss music would’ve been better suited for non-boss battles. There is very little voice acting, and Tracy does almost all of it. It’s not especially well done either; he sounds like a poor version of an Animal Crossing character talking. The graphics are good for an eShop game, and the world is very colorful. Also the 3D is very strong, I wouldn't suggest putting it on full blast for more than an hour. Whether you like 3D or not, you can always turn it off. 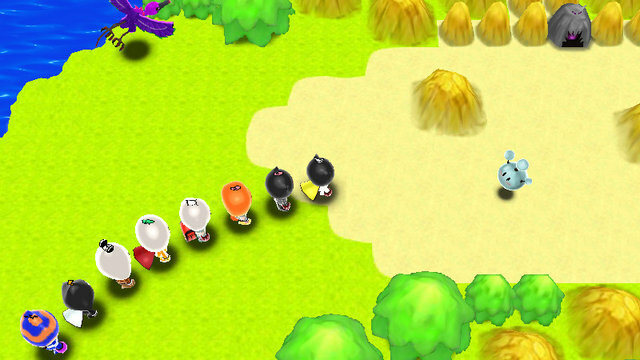 Unlike the first Denpa Men game, where you can only go between dungeons, The Denpa Men 2 has an open world to explore. Don’t worry; you don’t have to run long distances to heal, as there is a jump feature, where you can warp to any town or location you have visited before. Without this feature it would be painfully annoying running from place to place, and the jump feature saves plenty of time you would normally spend commuting from these locations. Unfortunately the open world has a severe problem; sometimes it is hard to figure out where to go next. After a certain point in the adventure you can ask a fortune teller, but she usually gives very vague hints. The worst part about this is that I had trouble finding a guide online; the best I could find was the official Denpa Men blog but even that doesn’t cover everything. Wondering around for an hour trying to find where to go next can become frustrating, especially considering enemies are everywhere. It’s hard to explore the world when there are so many enemies that will chase after you. Even if you do happen to know where everything is, you’ll end up having to do some level grinding. Level grinding in video games is polarizing with gamers; some like it, some absolutely hate it. One rule about most RPGs is there will always be some grinding involved, and The Denpa Men 2 follows the same rule as the others. While the downsides can be troubling, The Denpa Men 2: Beyond the Waves still has a lot of good qualities going for it. Finding and catching Denpa Men through radio waves is a very creative feature that you can’t find anywhere else, and overall the game is an enjoyable experience. Think of The Denpa Men 2: Beyond the Waves as an introductory RPG; it’s great for new gamers and gamers who are new to RPGs, all while being satisfying enough for the average RPG gamer. You’ll get at least 30 hours or more from the main story, along with the post-game content, and all at only $12. 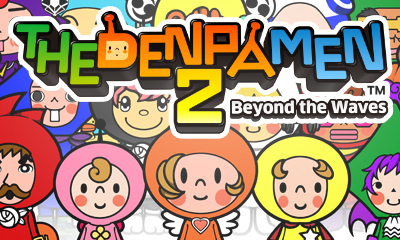 It’s not without its faults, but if you’re looking for a good budget RPG, make The Denpa Men 2: Beyond the Waves your next eShop purchase. Nice work Gamergy and thanks for reviewing this game! The boss is too overpowered in the area. I forgot to comment on the review lol. I probably would've played this last year if not for Animal Crossing. Spent way to much time doing what really?! Nice review and I do want to play it someday! That boss really is overpowered, when I finally got to it I lost in about five seconds. The final boss in The Denpa Men 2 is overpowered as well. My strategy for TDM2's final boss is to bring as many full potion S and revive potions as you can. My Denpa Men were all around level 70, but they would still get knocked out in 2 or 3 attacks. If you can use a full potion S every turn it's not too hard. @Tech101 wrote: I probably would've played this last year if not for Animal Crossing. Spent way to much time doing what really?! Um...this is such a fun game, but it is really hard sometimes too. Um...your review is so nice. This series is rather strange, but it's fun and challenging as well. Your review is superb, however I would have given the game an 8/10! Fair review and fair score. Thanks for the feedback everyone! Your guys' comments are what keeps me writing! Your review is great! Nice tagline FTW! Well that was a good read! When can we expect the review for The Denpa Men 3? I really enjoyed reading your review @Gamergy! I need to get around to finishing this game, but I have too many games left in my backlog. I never liked this series, but that's just my opinion not a fact. Your review rocks! Awesome review! This is on my long wishlist of eshop titles that I plan on downloading! I love the cute story and characters in The Denpa Men series! This is comment number 32! Congratulations, it's no surprise given the quality of your articles. @Link_i_am wrote: This is comment number 32! Congratulations, it's no surprise given the quality of your articles. I couldn't agree more these articles are what makes WiiWareWave so great! Wow, over 30 comments and 25 likes! Thanks to all of you guys! @Gamergy wrote: Wow, over 30 comments and 25 likes! Thanks to all of you guys!